Remember the Multi-millionaire from Japan who became a huge Nigerian Olympic under 23 fan? Well he is one serious fan! 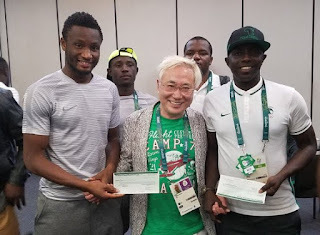 Japanese multimillionaire gives Mikel Obi and Samson Siasia $390k that he promised them if they win a medal, whether Gold, Silver or Bronze in the football event at Rio Olympics. Well Nigeria endured a hard fought bronze medal match to beat Honduras 3-2 to win the bronze medal at the Rio Olympics. 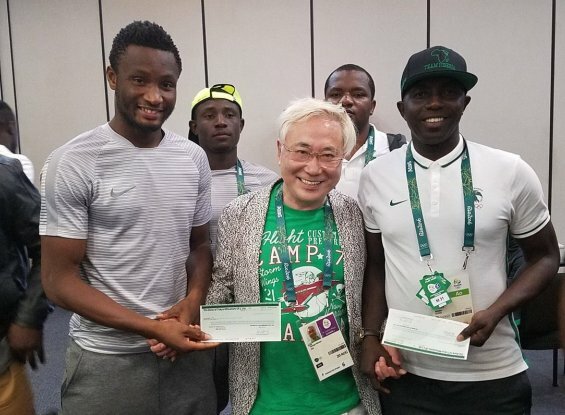 And Nigeria's biggest and most generous supporter presented a $190k cheque to Mikel Obi and $200k cheque to Samson Siasia, a total of $390k. 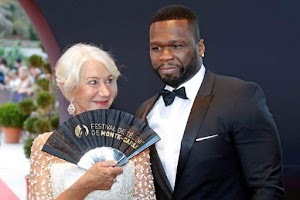 Incredible gesture from a man who hails from another country.